Recent release “Suzie's Messy Room” from Page Publishing authors Diane N. Quintana and Jonda S. Beattie is an excellent story aimed at children to teach them basic principles of organization that will serve them for a lifetime. 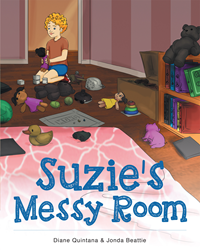 Diane N. Quintana and Jonda S. Beattie, both active members of NAPO (the National Association of Professional Organizers), have completed their new book, “Suzie's Messy Room”: a fun and easily approachable look at teaching children to not be overwhelmed by clean-up time. Published by New York City-based Page Publishing, Diane N. Quintana and Jonda S. Beattie’s easy and informative story begins with typical, active, five-year-old Suzie. Suzie loves playing with all of her toys in her room and sometimes creates a real mess! When her mother asks her to clean up her room, Suzie is overwhelmed and doesn't know how to begin. Suzie's mother helps her complete the job by breaking the project into small tasks that Suzie is able to finish easily. Some of the basic principles of organizing included in this story are: breaking projects down into smaller steps, sorting like with like, all belongings need a home, and a reward for completed tasks. Readers who wish to experience this adorably educational work can purchase “Suzie's Messy Room” at bookstores everywhere, or online at the Apple iTunes store, Amazon, Google Play or Barnes and Noble.